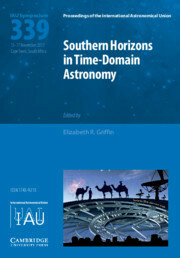 IAU Symposium 285, New Horizons in Time-Domain Astronomy, gave a comprehensive overview of the status quo in 2011, exploring, astronomical variability at both Galactic and extragalactic distances. Several years later, IAU Symposium 337 witnessed a new level of activity and planning, with ambitious instruments that add a new dimension to some of those current in 2011 and ingenious methodology in the emerging field of ?astroinformatics?. Major new instruments, whose output dwarfs those previously available, and analysis techniques that could not have been implemented until very recently, are being coupled with a broadening diversity in wavelengths. IAU S337 introduces the rich potential for new techniques for both analysis and communication, while covering the basic fundamentals such as data quality, standardization and archive access. Many early-career scientists are already central players in these projects: time-domain astronomy is the future and in their hands may it flourish and grow.